The mystery surrounding a nearly unknown whale species is slowly being revealed as a New England Aquarium scientist has released underwater video and new information from his November field season among the Omura’s whales of Madagascar. Dr. Salvatore Cerchio led a team of Malagasy and American whale biologists that found the largest aggregation of the 33-38 foot, tropical whales that has ever been seen. Last October, Cerchio had released the first ever confirmed video of live Omura’s whales in the wild, and those first time images generated waves across the Internet and international mass media. The following month, the Cape Cod-based researcher returned to the isolated northwest coast of Madagascar to continue his study of these small, relatively slender, grey whales with uneven coloring around their heads. Cerchio has been studying marine mammals around Madagascar since 2004, but this past trip was a whale jackpot. When he arrived, the local boat operators in Nosy Be reported unprecedented levels of “tiny shrimp” in the water. The shrimp were actually euphausiids, a tropical type of krill that will be identified to the species level with ongoing lab work. Lots of food anywhere in the animal kingdom usually attracts lots of animals to feed on it, and consequently the Omura’s whales were seen in record numbers. Over the previous four years, Cerchio and his team had documented 44 individual sightings of these extremely rare whales. Last November, they made 80 individual sightings in just a month or nearly double the combined entire research record. There were other important scientific observations made. The Omura’s feeding behavior was seen frequently and videotaped. Five mother/calf pairs were counted, which is a record. A specific female was identified for the third time in four years which indicates that the population might be resident or at the least uses the same habitat annually. The team collected two weeks of continuous acoustic data from remote recorders including dense choruses of Omura’s songs. This is the start of the first long term passive acoustic monitoring for Omura’s or for any whale species in this region. The new underwater video shows feeding, mother/calf pairs and the species’ distinct irregular marking and colorings around their head. VIDEO OF FEEDING: The large, round bulge below the jaw seen in some of the video is the Omura expanding its long throat pleats so that it can engorge a tremendous amount of water and krill, trap the food on its baleen, expel the water and then swallow it. These throat pleats are common to the rorqual family of whales which includes the giant blue whales and the acrobatic humpbacks. VIDEO OF MOTHER/CALFS: The video with two whales is of mothers and calves A record five calves were sighted. VIDEO OF UNUSUAL MARKINGS AND COLORING: Some of the video shot from the side and above clearly shows the uneven coloring and marking near the head that helps distinguishes this species. The only whale with a similar pattern are fin whales, but they are commonly 60-70 feet in length and primarily live in cold waters versus the diminutive Omura’s that are just 33 to 38 feet in length and make tropical seas their home. An alternative name for Omura’s whale is the dwarf fin whale. Just last year was the first time these whales have been recorded in the wild. The video made waves across the internet when we shared it last year. This YouTube clip has garnered more than 790,000 views! Dr. Cerchio will return to Madagascar in May, and his research was funded by the U.S. Marine Mammal Commission. 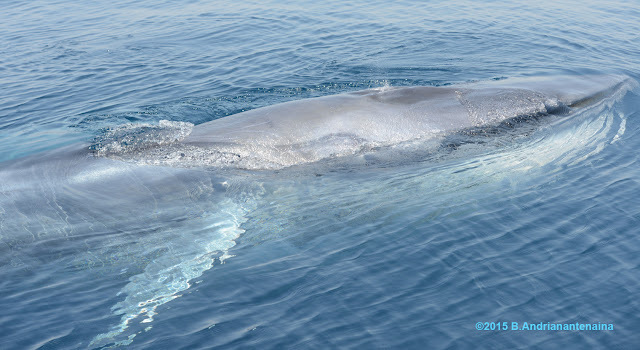 For more information on Omura’s whales and Dr. Cerchio’s research, visit www.omuraswhale.org. And for an in depth feel for his research in Madagascar, head over to the Explorers Blog for more pictures and dispatches from the field. Awesome. So big, so fragile because of humans.